Queen of Swords says you have a sharp wit – a serious, good counselor who can give the right kind of help – having developed great spiritual depth through prolonged struggle, which reflects the mastery of a fair, objective, rational mind. Centered – it is the observing mind which considers options fairly and demands the abandonment of pretense. Always seeking clarity and truth – going beyond the masks and defenses to the depth of the person. The counselor within awakens as she seeks clarification and desires to get to the bottom of things. She symbolizes the connection between sorrow and wisdom – having faced sorrow with courage, acceptance and honesty, she has found wisdom. She uses her intellect to free herself from confusion, doubt and fear. She frowns at the world, while continuing to open her hand to it. Though clouds gather around, her head remains above in the clear air of truth – for she recognizes that neither sorrow nor courage are restricted by gender. Be at peace with yourself – accept whatever happens without loosing your composure. Let the “negative” be absorbed by the light of your positive, healthy mind. Seek the truth by seeing through the illusions. Maintain a balanced mind. Mental, assertive, perfectionist, protective, ambitious mother. Mother of solutions, philosophical, studious, alert, direct – good director or planner. A knowledgeable leader. Tactician, fighter, mother of ideas and ideals ruled by the drive of the heart. Highly informed, good communicator, mother of technology and invention – channel for thought. Here is the source of the will to achieve, to maximize the potential of the self. How are you utilizing your mental and communicative abilities? Who is helping you see the alternatives by pointing things out to you in a rational, perhaps critical way? How are you being discriminating and analytical? In the first position: Here the intellect is applied to nurturing and caring. Here is society’s librarian who is guardian of our collective knowledge, our recorded history. This is the spirit that modern society is witnessing at the turn of the twenty-first century, the spirit that asserts equal priority of the feminine principle. This is the warrior female whose causes are passions worth fighting to the death for. Joan of Arc lives in this archetype. In the second position: This may be someone, perhaps a family member on whom you can fall back. The advice you receive here is most important. This could also suggest that you own independence is your greatest asset. You react quickly, stepping into the breach of any problem to nip it in the bud. 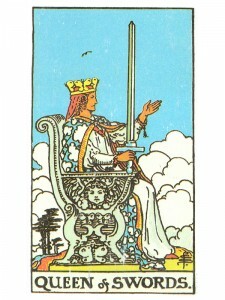 In the third position: Think well on this card for she is coming to you in one guise or another. As a guide and source of inspiration, she is directing you attention to your mental house, that you may increase the efficiency there. In the fourth position: Here is the passion for esoteric knowledge of spiritual truth – an early understanding of the central importance of learning which enables us to be fully human and to realize and maximize our potential. The source of mental will which merges with emotional desire to move us upward. Ambition in a young heart. In the fifth position: Much of this queen’s energy is in the Major Arcana card Justice, which governs this very position in the spread. Your thoughts are very much on the entire process of centering, of balancing forces and of mental projects. You may, of course, be thinking of this queen personified. In the sixth position: This queen is in your emotional house in the near future. If she is not presenting herself in person, then mental matters are pulling at your heart. Another possibility is that you are to be much more alert and responsible in your emotional and creative affairs. In the eighth position: The queen is in your house. This archetype will bring authority and direction to your material affairs. She may give everyone a list of things to do. In the ninth position: Perhaps your heart is on this queen. She may be an object of your affection or the centerpiece of a creative project underway. Her programs may dominate your feelings. In the tenth position: Here is the support, the energy and resources that you need to enhance your Mental Plane and it may well come in the physical personage of the Queen of Swords. It may however, be the access to what she represents. She brings the knowledge and courage you need to formulate and advance your goals. Thanks for your brilliant advice. U are truly gifted.